The last Supergirl comic set within the DC Universe was published on March 18, 2015. That was before Kara Zor-El became a household name as the central character on a hit show, a beloved figure among children and toy collectors due to DC Super Hero Girls, and an eagerly anticipated new fighter in the upcoming game Injustice 2. In short, Supergirl’s stature has risen considerably in the year and a half since she left the world of ongoing comics, which makes her return next week that much more exciting. SUPERGIRL: REBIRTH #1 finds the young Kryptonian still suffering from the loss of powers she was experiencing prior to the start of Rebirth, but nevertheless serves as a fresh start for the Girl of Steel and a perfect jumping on point for brand new readers. While it’s not set within the world of the popular CW series like last spring’s THE ADVENTURES OF SUPERGIRL miniseries, it features many characters that will be familiar to fans of the show, along with others that will resonate with longtime comic readers (oh hello, Cyborg Superman!). Written by Steve Orlando and drawn by Emanuela Luppacino, it’s a fun, feisty new comic that’s sure to satisfy Supergirl fans no matter which version of the character they’re more familiar with. But why take our word for it? We recently sat down with Orlando to ask what we can expect when Kara once again takes flight within the DCU. It’s been a little while since we’ve had an ongoing Supergirl title in the DC Universe. What can we expect from yours? It has been a while! The last time we saw Supergirl, she was really trying to deal with being on Earth. She’d just arrived, and we saw her reacting to the world. She was angry and she eventually became a Red Lantern. In our series, she’s owning this outsider status and finding a way to acclimate. She’s trying to decide if Earth is really where she belongs. At the same time, keeping that outsider status means that we’re getting back to what makes her special. Kara has an understanding and a compassion for people that I think is unique to her, particularly people who have had to leave their home, countries and families. She’s incredibly caring. So we’re sort of giving up that anger and getting back to her as someone who cares right out of the gate. We’re doing this with all of the large sci-fi ideas that I think are wonderful about comics and Kryptonian-led books. To make Kara’s decision for her extremely real, we’re bringing back Cyborg Superman, who as we saw in the previous run is her father, Zor-El. He comes back and says that as her father, he just wants to do what’s best for her and if she’s so sad here, well what if she could go back to Argo City? What if he could give that back to her? But Cyborg Superman is also insane. What he thinks she needs, maybe that’s not her greatest wish. Maybe it’s her worst nightmare. So are there other characters fans can look for outside of Kara and Cyborg Superman? There are a lot. We’re going to be introducing some new characters, and we’re moving her to National City. We’re connecting her to Cat Grant in a new way. We’re connecting her to her human parents, the Danvers, in a new way. She’s working for the DEO, which is led by Cameron Chase. Kara’s at the DEO to further her main goal and objective—understanding humans. To protect us, she has to understand us. The DEO, her life as Kara Danvers, her secret identity, those things are coming back and they’re the doorway to show us what really is unique about her character. People ask why she has a secret identity. Well, Kara Danvers is a tool for Kara Zor-El to understand humanity. She knows she wants to help us. Kara Danvers is how she learns how to do it. How old is Kara in this series? She’s sixteen years old in the DC Universe. She’s going to be working for Cat Grant as a work-study. She’s also going to be going to high school at a science school that’s based off of some of the tech high schools in New York. Earth technology is like the Stone Age for her. So even going to this advanced science school is almost remedial for her, and we’ll see that immediately. You and I wouldn’t know how to use an abacus if we just picked it up. That’s what head-up displays and wi-fi are like for her. She’s at this school because it’s challenging for her, and again it’s a window for her to meet people her own age and to go through the experiences that make someone human. It’s to make her even better at the job she’s picked up, which is protecting humanity. With Supergirl a hit on TV, there are more people now aware of Kara and her world than ever before. What are you hoping to contribute to that greater story? I think you always want to lead with the comics. The show and the digital comic, ADVENTURES OF SUPERGIRL, have what I think is a beautiful take on the character. What we bring are things that I think you could only find in the comics. Enormous adventure. Enormous ideas. One panel that has more ideas than you could ever afford to do in a whole episode of a TV show! We’re bringing it back to these sort of wild, crazy, lovably strange sci-fi roots that are so present in the Superman and Supergirl mythos. I mean, Krypton is a weird place and I’m excited to bring that sort of joyful strangeness and adventure to her, through her lens, which is unlike her cousin’s. I want to show people why she’s just vital as a character. Supergirl makes like her cousin and returns on August 17th in SUPERGIRL: REBIRTH #1 by Steve Orlando and Emanuela Luppacino. 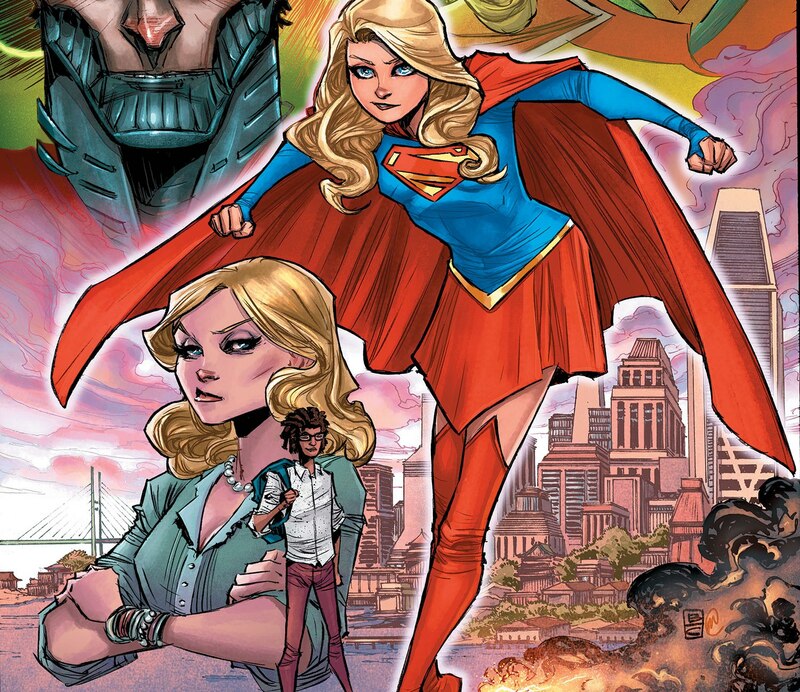 Her story then continues on September 7th in SUPERGIRL #1 by Orlando and Brian Ching. This is the latest in a series of interviews looking at the many DC comic books that will be spinning out of this summer’s Rebirth. Keep an eye on DCComics.com for more! Quoting Ms. Quinn: Can You Spot the Fake Harley Quotes?